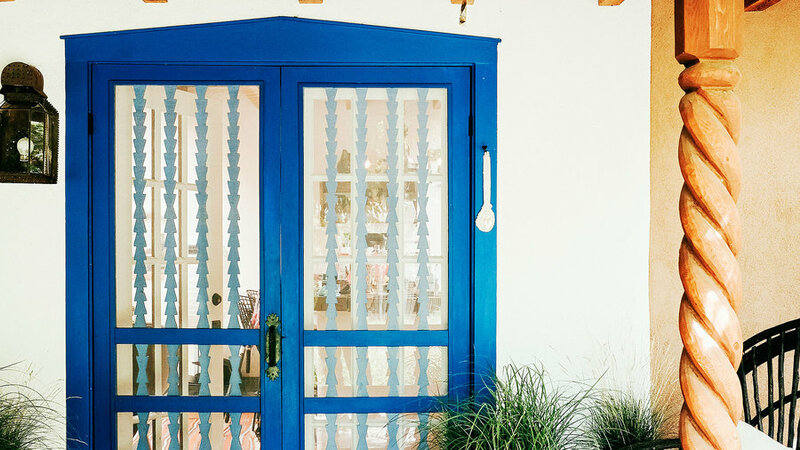 Susan Stella chose a bright blue door and window frames for her New Mexico home. Local lore says the color reflects the sky, keeping out evil spirits. Her porch stays true to pueblo style with creamy stucco and natural wood beams. Each element says old Southwest while also managing to feel fresh. 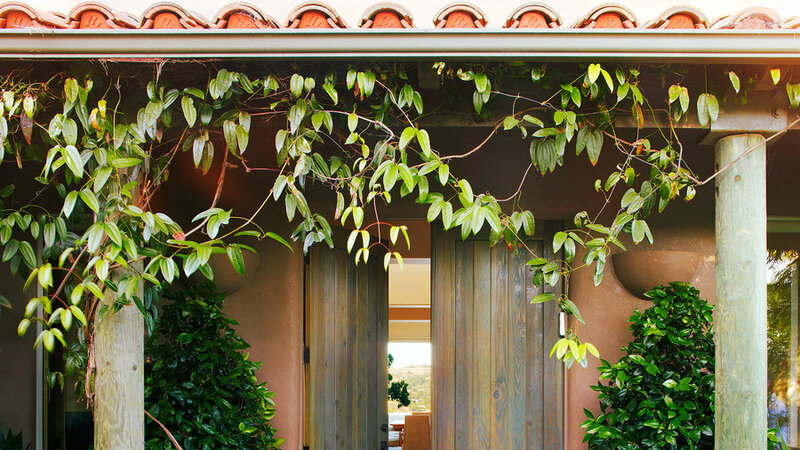 A mix of formal shrubs and potted succulents produces a welcoming and balanced entry. Dainty Clematis montana hangs from the roof line, while rounded boxwood and sculptural Agave attenuata enclose the porch. Pyramid-shaped wax-leaf privets regally flank the front door. 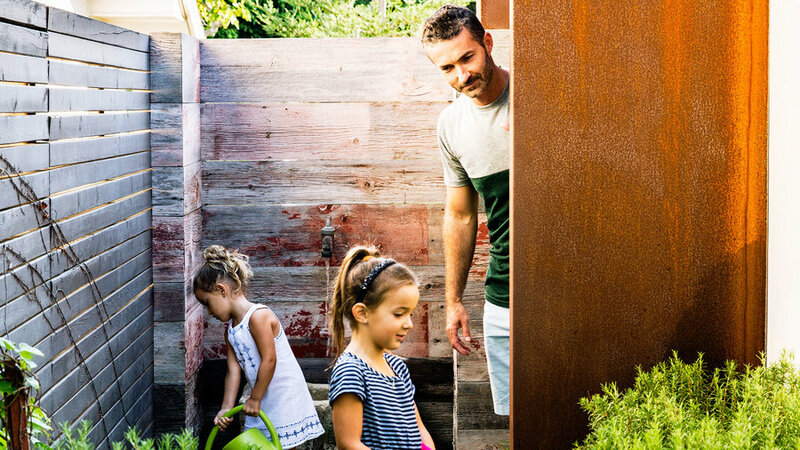 A sidewalk flanked with rosemary and succulents leads to this Corona Del Mar home’s front door, actually located on the side of the house. Eric Olsen framed the door, which opens right into the great room, with rusted steel. Did you think this was the door into the house? Think again. The owners of this mid-century home walled off the top level to create an outdoor room behind a façade. The effect is the appearance of a whole new house. Although it’s not the main door, this front door features a ginormous handle that’s magnificently modern. Instead of standard-issue colonial red, this traditional entrance is painted kelly green. “I wanted something a bit more organic that would tie into the trees,” homeowner Kerry Kane says. The original molding surrounding the door pops even more when painted black. 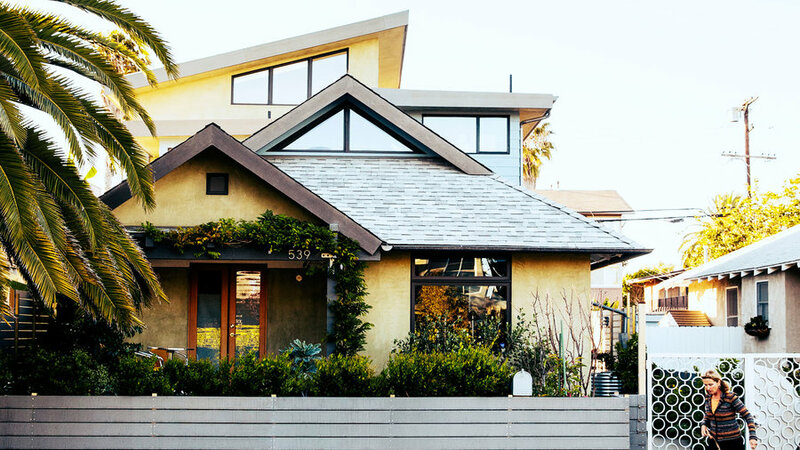 “You get that this house is young and fun, but also in line with the architecture,” says designer Frances Merrill. 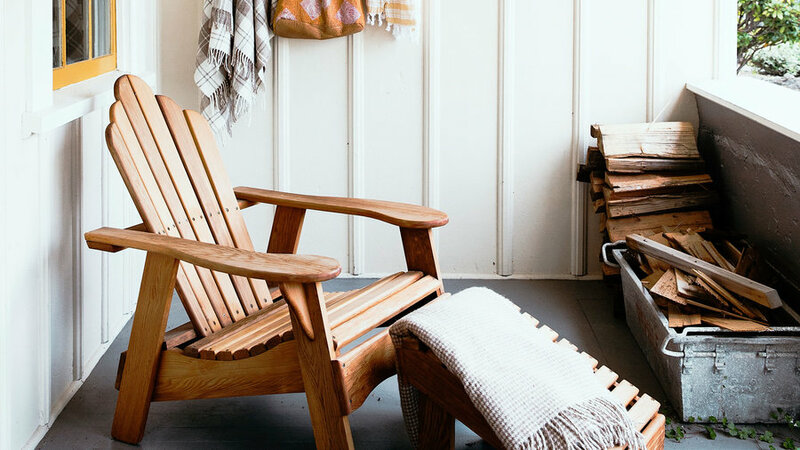 A porch that feels lived in offers guests a cozy welcome. The Adirondack provides a place to sit with a cup of coffee in the mornings. Hooks line the wall as a place for wet outerwear and scarves. With one look at the collection of belongings, you know you’re at an open-hearted home. Orange promotes optimism and warmth. 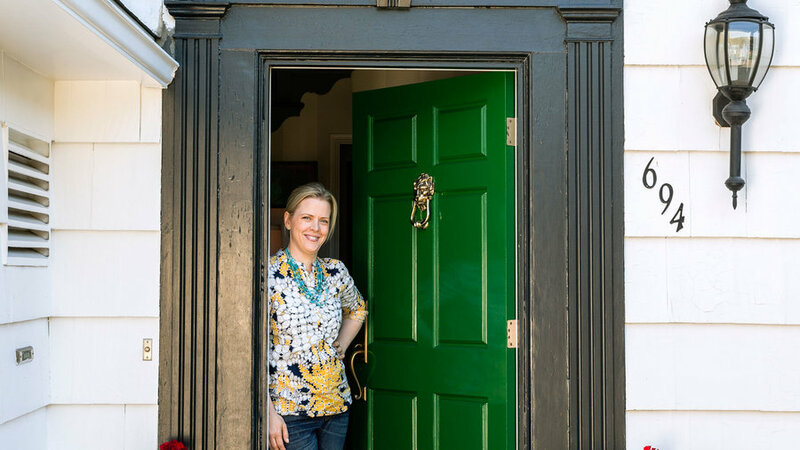 What more could you ask for in a front door? 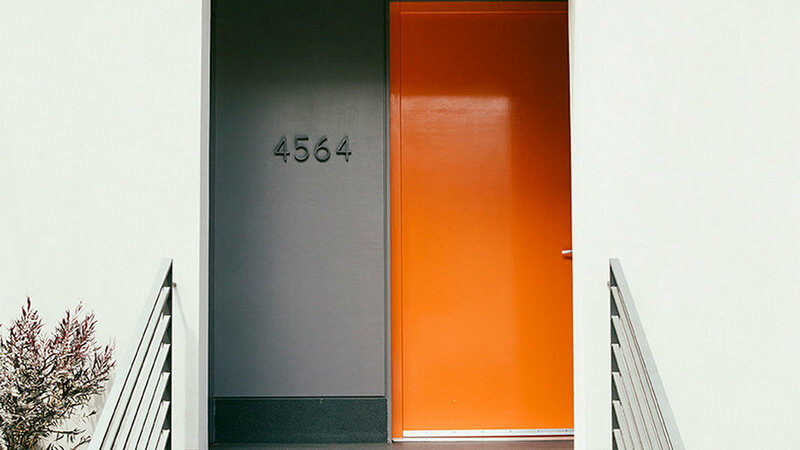 The jolt of color balances the chic concrete grays. 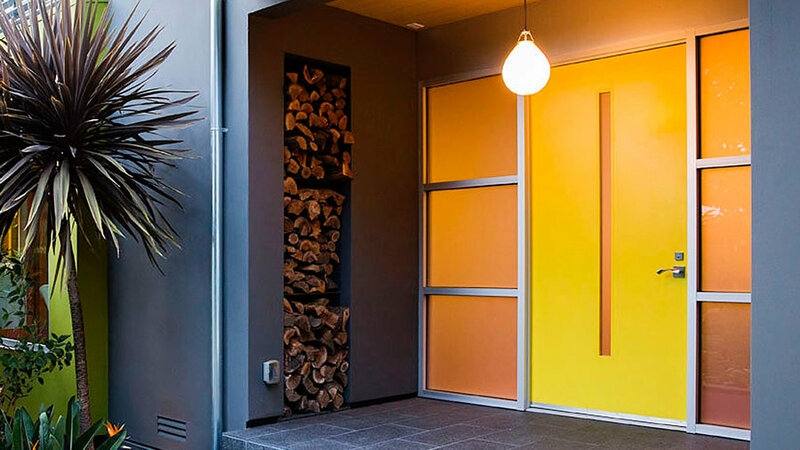 This stoop’s modern minimalism plus the brightest hue achieves pop-art status. 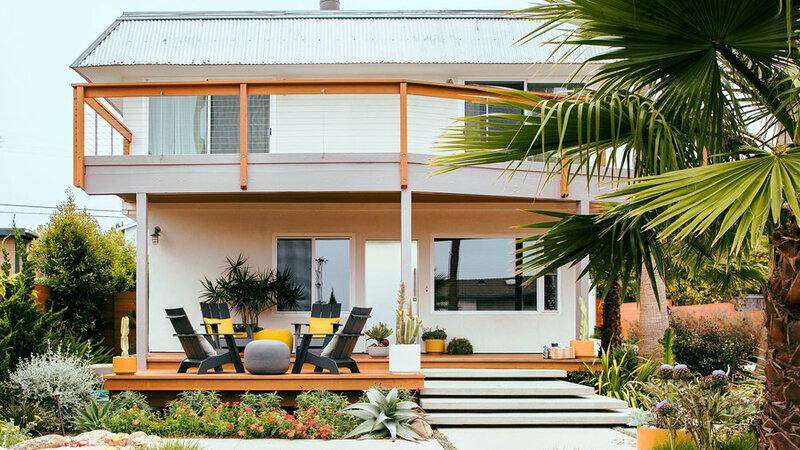 Isabelle Duvivier replaced an aging stucco finish and an unfriendly chain-link fence in her Venice bungalow renovation. Duvivier maintained the modest exterior but made it more welcoming with a front-yard vegetable garden and a low fence. Her foliage-draped entry fills her front porch with a natural ambiance. 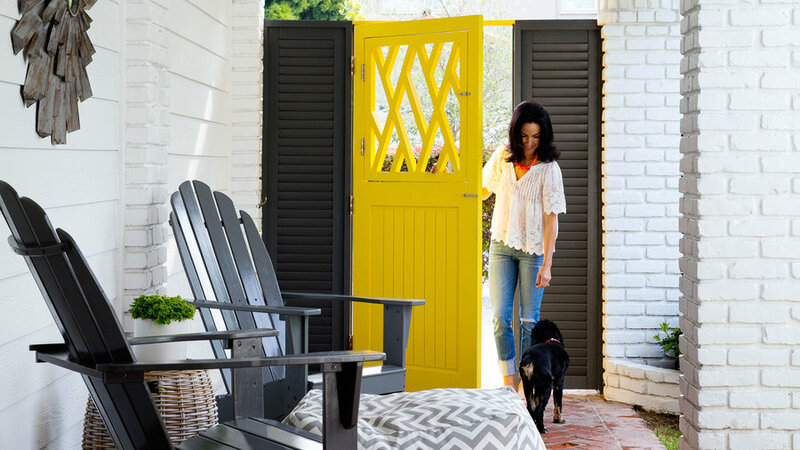 Interior designer Jill Soderlund brought a ray of sunshine to her home with a daisy yellow door. The black shutters and patio chairs create a preppy atmosphere. We bet that after a long walk, her dog loves that chic chevron bed waiting for him at the entrance. Go Scandinavian with a modern pendant light and industrial windows. Let light in without losing privacy with an elongated door slit. 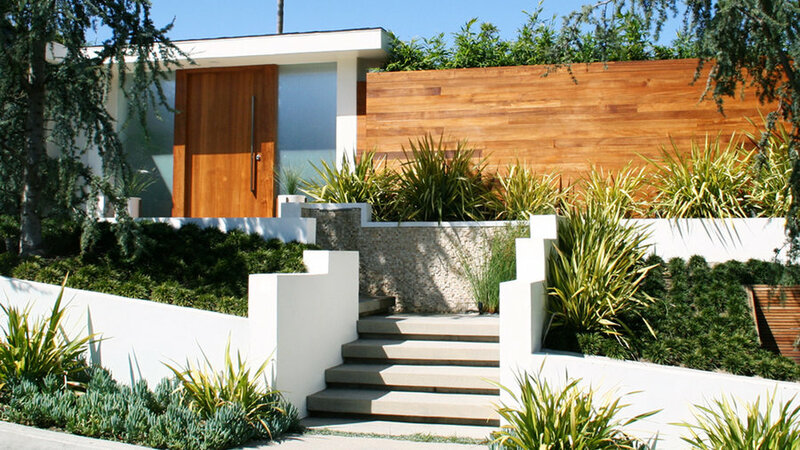 On the side, a place for firewood adds woodsy charm to the ultra modern home. 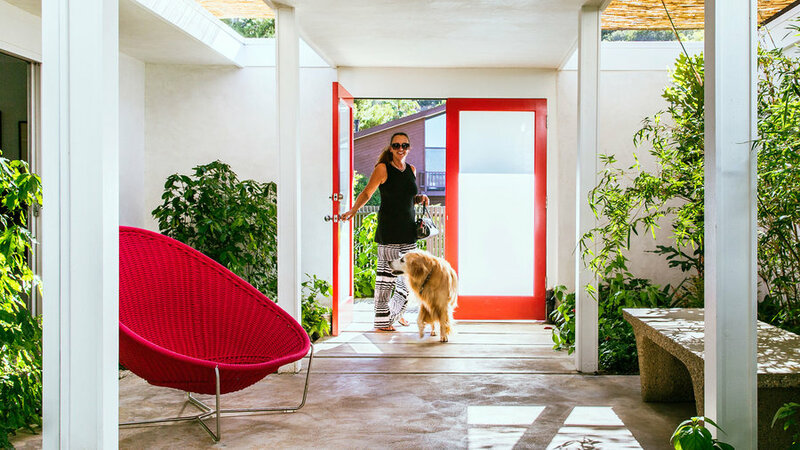 Randy and Debbie Hild chose a statement color for their light-filled entry: lipstick red. Bold but not overwhelming, the rouge hue carries from the door frame to a fantastic mod lounge. Frosted glass keeps the home bright but secure. Landscape architect Keith Willig placed giant pavers separated by cool blue stones to lead to this Menlo Park entrance. 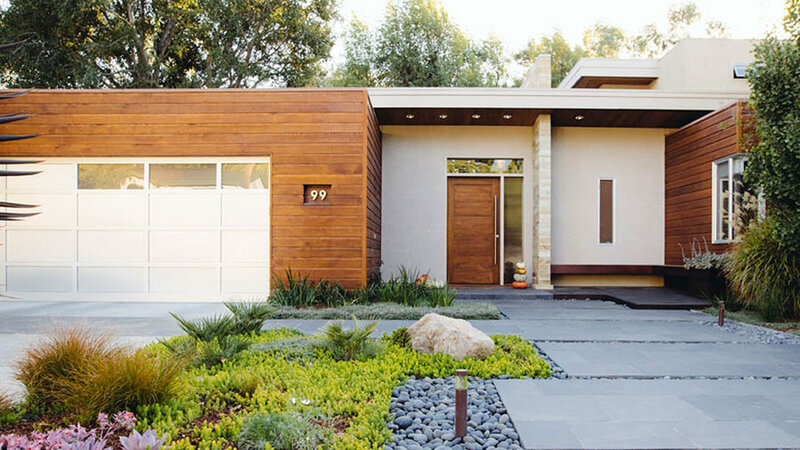 The front door echoes the rest of the building material, achieving serene balance. To the side, a vertical window lets light into the mid-century house. With its laid-back seating area and lush landscaping ideas, this yard is as much a place to hang out as it is a welcoming path to the front door. Before the yard’s remodel, there was no path to the front of the house—just a driveway along one side. Now, wide, inviting steps lead to the front door with stops along the way: at the firepit and a cozy gathering spot on the porch. Mexican pebbles fill the spaces between the sand-finish natural gray concrete pavers, creating a permeable surface. 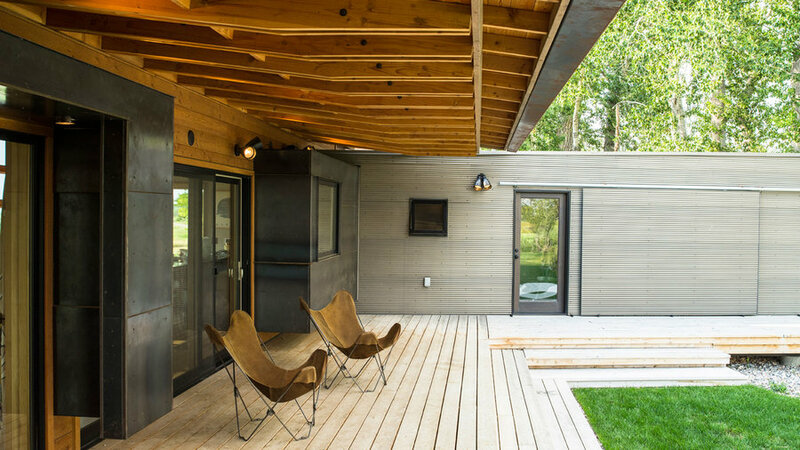 A deck wraps around the front of Jeanne and Paul Moseley’s pre-fab, making it not only their entry but also a place to hang out. The relaxed chairs and wood awning provide relief from rain or shine. Kyle and Lauren Zerbey tore off aluminum siding to achieve maximum curb appeal. It exposed 1910 old-growth cedar to frame their entry. The navy against a burnt orange door put complementary colors to work. 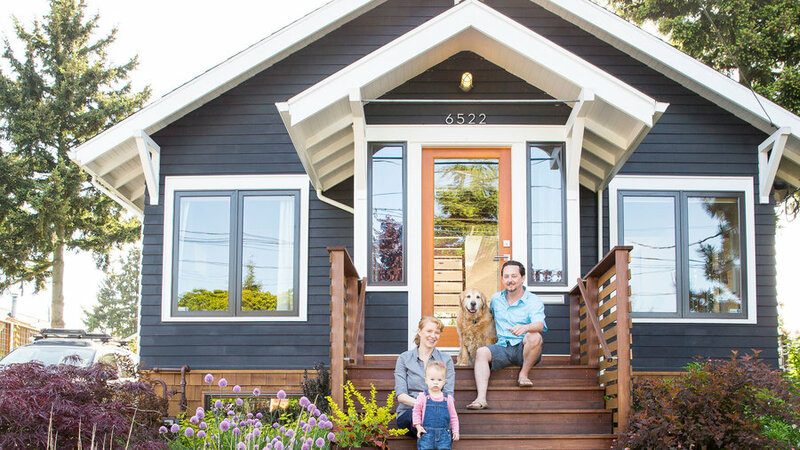 A simple light and street numbers finish the porch with no fuss.